RRB JE Recruitment 2019 exam pattern, syllabus: Railway Recruitment Board (RRB) will recruit 13,487 Junior Engineer posts across the country. The official notification commenced from January 02, 2019 and will end on January 31, 2019. Candidates who wanted to apply for Junior Engineer need to visit the official site of RRB at rrb.gov.in or from any regional RRBs site and apply. Candidates who have applied for the position or will apply can check the exam pattern, syllabus and cut-offs here. 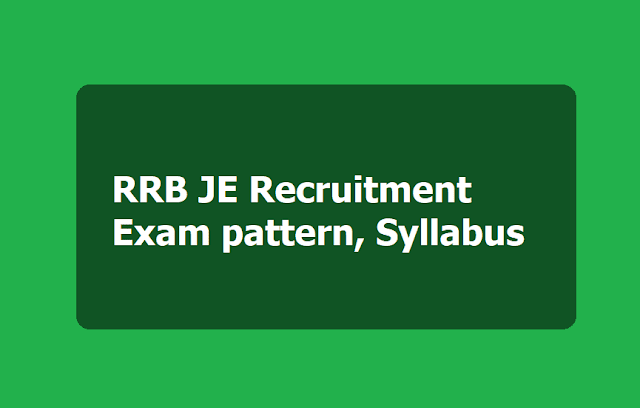 RRB JE recruitment process comprises of two stages- First stage CBT exam and Second stage CBT exam. The 1st stage CBT is of screening nature and the standard of questions for the CBT will be generally in conformity with the educational standards and/or minimum technical qualifications prescribed for the posts. The normalized score of 1st stage exam shall be used only for short listing of candidates for 2nd stage exam as per their merit. Candidates who are shortlisted for 2nd stage CBT availing the reservation benefits of a community, PwBD and ExSM shall continue to be considered only against that community for all subsequent stages of recruitment process. First stage CBT exam comprises of four subjects- Mathematics, General Intelligence and Reasoning, General Awareness and General Science. The exam comprises of 100 questions and duration is 90 minutes. Mathematics : Number systems, BODMAS, Decimals, Fractions, LCM and HCF, Ratio and Proportion, Percentages, Mensuration, Time and Work, Time and Distance, Simple and Compound Interest, Profit and Loss, Algebra, Geometry, Trigonometry, Elementary Statistics, Square Root, Age Calculations, Calendar & Clock, Pipes & Cistern. General Intelligence and Reasoning : Analogies, Alphabetical and Number Series, Coding and Decoding, Mathematical operations, Relationships, Syllogism, Jum -bling, Venn Diagram, Data Interpretation and Sufficiency, Conclusions and Decision Making, Similarities and Differences, Analytical reasoning, Classification, Directions, Statement – Arguments and Assumptions etc. General Awareness : Knowledge of Current affairs, Indian geography, culture and history of India including freedom struggle, Indian Polity and constitution, Indian Economy, Environmental issues concerning India and the World, Sports, General scientific and technological developments etc. General Science : Physics, Chemistry and Life Sciences (up to 10th Standard CBSE syllabus). Second stage CBT exam comprises of 150 questions for 120 minutes duration. The subjects included in 2nd stage CBT exam is General Awareness, Physics and Chemistry, Basics of Computers and Applications, Basics of Environment and Pollution Control and Technician Abilities. Technical Abilities: The educational qualifications mentioned against each post shown in Annexure-A, have been grouped into different exam groups as below. Questions on the Technical abilities will be framed in the syllabus defined for various Exam Groups given at Annexure-VII-A, B, C, D, E, F & G.
RRB JE Recruitment 2019 exam will conducted during April/May, 2019. The expected cut-offs will be based on the difficulty of the exam, the number of vacancies in the department, number of candidates applied for the job and number of qualified candidates in the entrance exam. The Board releases different cut-offs for various category General, OBC, SC & ST. Candidates will get the complete expected cut-offs once the examination is conducted.